I had to trim my ends yesterday. It had to be done because I had a lot of split ends. It really bumed me out though because I’m doing the castor oil challenge and I feel like I cut off any length I had retained. On the other hand if I neglected to pay attention to my split ends I would probably loose length. I can’t win for losing. I really hope I get a big growth spirt like they say can happen when you trim your ends. You know who they are. The all knowing natural hair association. The group of naturals that are on every social media outlet that seem to be all knowing in everything hair. Well anyway I trimmed my ends and I styled my hair like I use to when I first went natural. I even bought some Sta-Sof-Fro like old time cause despite me using castor oil and other essential oils my hair dried out bad cause of the dry could weather. I just went back to the basics a little or where I started. I really hope I have a significant amout of growth by the summer. 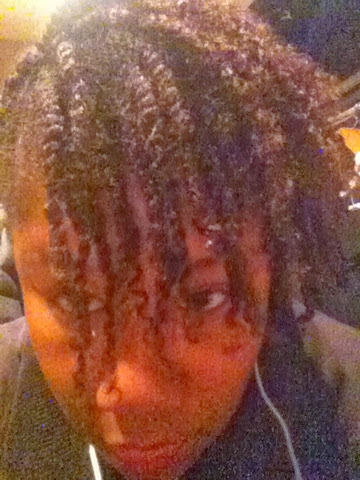 I’m thinking about doing twist again if I have time. I just need two days of nothing on my plate and it’s on. Happy New Year. What are some of your hair goals this year?